The more finished this new pond at Fuji Park gets, the more disappointing it is. First, it’s not in Fuji Park at all. 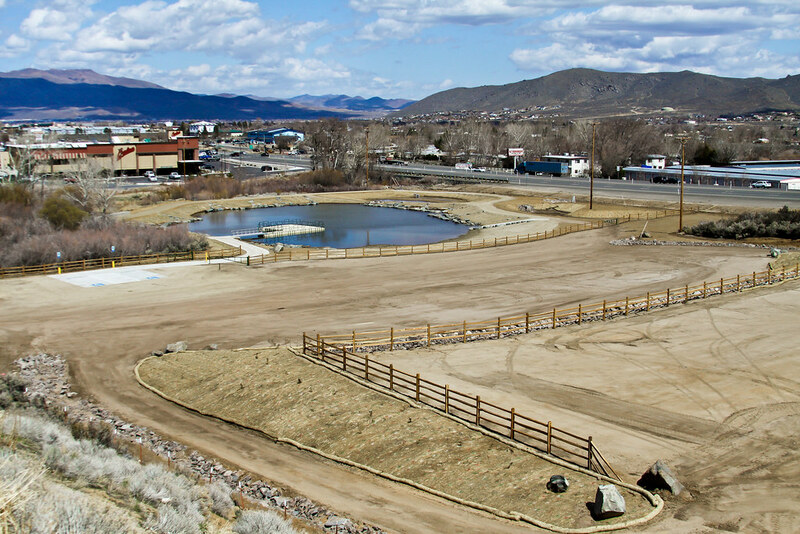 It’s behind the Carson City Fairgrounds, on the other side of the river, back where everyone can see it from the highway but you’ll need signs and arrows to tell you how to get there. This could have been so much better if it was over by the grassy area of the park itself, maybe even built so that Clear Creek flows through it. Second, they always claimed the pond would be “one acre” in size. This does not seem to be an acre. Third, and maybe this is like going to Antarctica and complaining about all the penguins, but it’s so brown and desolate in this corner of the park and not at all inviting. They probably have some landscaping planned that they’re just waiting for spring to plant, but still this doesn’t look so much like a “pond” as a “mudhole”. Again, another reason they should have put it closer to the park itself, there are grass and trees already over there and they could have extended that to make the pond more exciting. 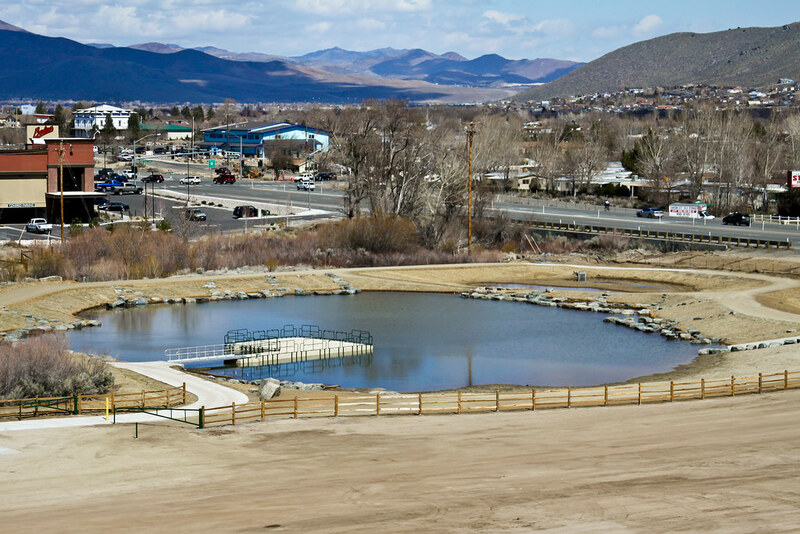 I guess the point of this pond is to create an urban fishing environment, so folks don’t have to head up to the hills to catch some trout. But usually urban ponds like this have other uses as well, like a place to go for a jog, or take your dog for a walk, or have a picnic. This pond doesn’t really look like it’s meant for any of that. Maybe the fishermen don’t want any of that, they just want to be left alone to fish. Just seems like this pond could have been so much more, and they missed the mark. I don’t mean to be so negative, it’s just hard to find much positive about the pond. The construction crews that are building it have done a good job, and I like the little pier that juts out into the middle. If I were fishing here I’d appreciate not having to stand on the shore. And it’s not even done yet, so I’m sure there will be plenty of vegetation growing around the edges after a few years. Look at the early days of any park and you’ll see dirt and scraggly little trees. But this pond just doesn’t look like something I’m ever going to visit, and they missed an opportunity to make it so much better than it is.